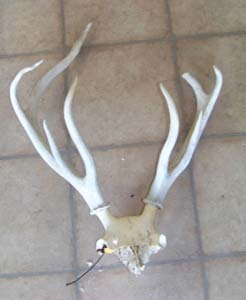 The main beam lengths off this Red Deer Skull measure 26 4/8 (left) and 19 4/8 (right). The greatest inside main beam spread is 18 4/8".Greatest circumference between points one and two is 5 5/8"(left) and 5 5/8"(right). Greatest circumference between points two and three is 4 "(left) and 3 7/8" (right). First point length is 11 3/8" (left). First point length is 11" (right). Second point length is 5 5/8" (left) and second point length is 6" (right). Length of third point is 8 3/8" (left) and 4 7/8" (right). Length of fourth point is 1" (left) and none (right). This Skull has been cleaned and it is weathered.